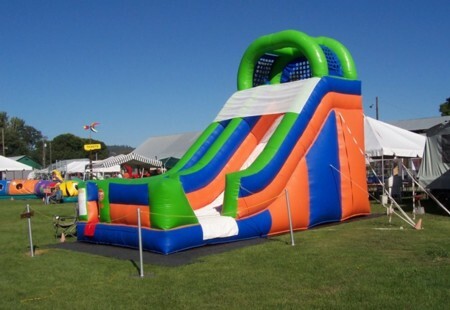 Our slide will add loads of fun to your event! Great fun for ages 4 and over. 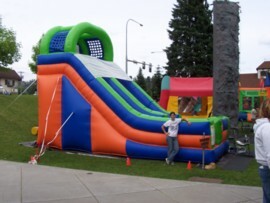 The slide is 18 feet tall, 11 feet wide and 25 feet long. It weighs about 340 lbs. Standard set up takes about 30 minutes, including carpeting at the entry gate, crowd control ropes and signeage. The set up location should be free of power lines and overhanging tree branches. It should be quite level. Sprinkler heads and water lines should be well marked so we do not drive our 16" anchoring stakes through them. Underground electric lines, phone lines, etc. should be marked. You should have a 110 volt electrical outlet with a 20 amp capacity within 100 feet for the 1hp 7 amp blower. Download our: Slide Set Up and Space Requirements in PDF format. Our 45 foot long two lane obstacle course is sure to challenge the most fearsome competitors. Go over, under, through and around; finally scaling a 15 foot incline climb and flop on down the slide. It is brand spanking new this year, all we have is the manufacturers picture as of yet! The obstacle course measures 45 feet long, 12 feet wide and 18 feet tall. It is has two sections that weigh a total of 550 lbs. It uses two 1 1/2hp blowers each drawing 8 amps continuously. You may want to download our: Obstacle Course Set Up and Space Requirements in PDF format.